While adding some few enhancement on an old project, ASP.NET webform-based API, I was having problem removing the HTML tag output from the API. I have written this project five years ago and I know that you can write a response from an ASPX page without the HTML tags. I simply should use the Response.Clear() or Response.ClearContent(). Response.Clear() is not working?!?!?! Here is the code that does not output what I want. And I got the correct output. This entry was posted in asp.net, Programming and tagged asp.net, c#, webform on October 12, 2015 by 60secondtutorial. As defined by MSDN: Extension methods enable you to “add” methods to existing types without creating a new derived type, recompiling, or otherwise modifying the original type. It was introduced in .NET 3.5 at the same time with LINQ – which in turn uses Extensions. That’s why all of a sudden, you can now use LINQ against Enumerables even though those objects where never modified. As defined by me: A very powerful feature that sometimes new developers forget, doesn’t care or doesn’t know about it or don’t quite understand how to create one. Consider the following scenario. To secure your application credentials at runtime, you decided to use System.Security.SecureString. The content of the SecureString is encrypted while in memory. Read the documentation about SecureString. You cannot assign a string directly to SecureString. It only has a method of AppendChar that accepts one character at a time. So to assign a string, you have to do this. Imagine you have to do this over and over in different classes in your code. So you decided to create a public static method and call it every time like this. How about doing it in a more elegant way. Like for example, when you convert the string into lower case, you would do this. And to convert to SecureString, you would do this. If you add ToSecureString() into your existing string, it will not compile. Because ToSecureString() is not a method or extension of string by default. We have to create an extension method to be able to do this. Create a public static method with the parameter you wish to extend. In this example, the string object. Put the this keyword before the object you are extending. Creating extension methods is easy after all. But don’t overdo it! Enjoy coding! This entry was posted in Programming and tagged c# on October 3, 2015 by 60secondtutorial. The introduction of async and await in C# 5.0 makes asynchronous programming a breeze. In contrast with traditional asynchronous technique that is complicated. However, you need to understand how the new technique works and how to implement it properly. First, lets see the code snippet below. A method that returns something. The method must not return void. Except when you’re writing an async event handler. The method must return Task<TResult> or Task if it returns nothing. The method must have at least one await operator. By convention, the method ends with Async suffix. So that you will easily identify that the method is asynchronous and can be awaitable as you can see in the succeeding example. TaskCompletionSource to the rescue. As defined by MSDN, “Represents the producer side of a Task unbound to a delegate, providing access to the consumer side through the Task property.” It is a little bit hard to understand but applying it in the example, I hope you can grasp the idea. Implementing an asynchronous programming is now easier than before. Likewise, you can make your own method to run asynchronously easily, too. However, it doesn’t mean that you have to convert all your methods to run asynchronously. In my own experience, I only convert those methods that require I/O and CPU extensive tasks that may complete for more than 50 milliseconds. This entry was posted in Programming and tagged async, await, c# on September 26, 2015 by 60secondtutorial. 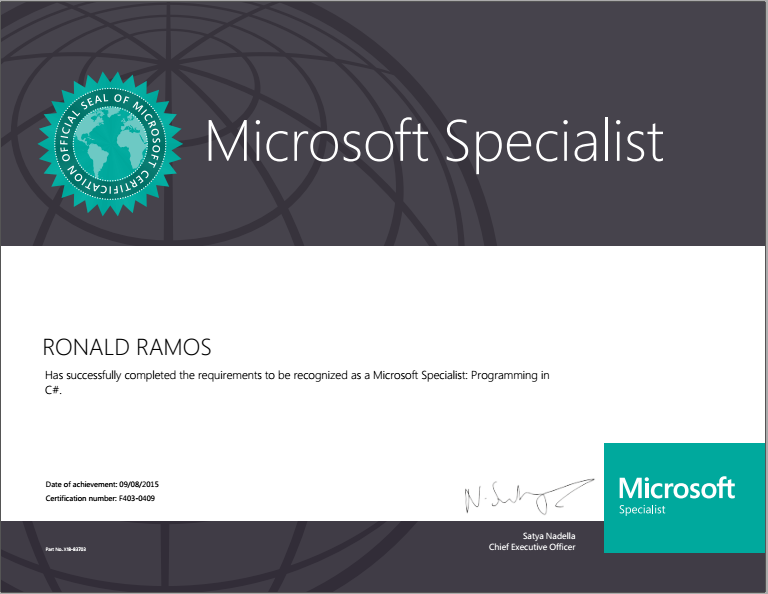 Passing the Microsoft Exam 70-483 is a validation of my skills in programming in C#. Although I’ve been programming in C# since C# 2.0, taking the exam was not easy for me. It is because technology is constantly evolving and so is C# which at the time of this posting, the current version of C# is 6.0 (released just two months ago.) However, the exam I toke covers up to C# 5.0. Do not use brain dumps. It does not only violates Microsoft’s Exam Policy but makes you just memorize things and not understanding them. There is no substitute for real-world programming. So practice by developing applications. This entry was posted in certification and tagged c# on September 19, 2015 by 60secondtutorial. “Hello World” is the most common example to teach a programming language. It shows the basic structure and syntax to print the word “Hello World”. This is the first step towards a bigger, interesting and yet challenging world of software development. ///Main entry to the program. Above code shows the most basic structure and syntax in programming C#. Line 7-10: Describes the type or type member. It is used in automatic documentation and used by Visual Studio IntelliSense to display the description of the said type or type member during development. Line 13: Comment – a one line comment. You should always document your source code well. Now let’s keep learning and challenging ourselves – and it has just begun. This entry was posted in Uncategorized and tagged c# on April 4, 2008 by 60secondtutorial.